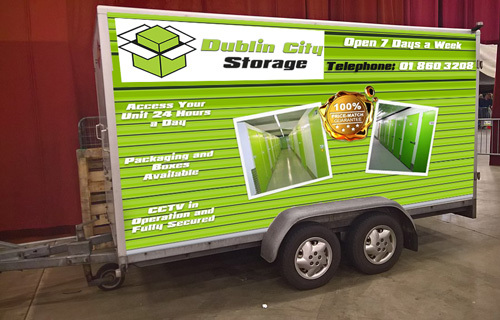 Dublin City Storage is now offering a Mobile Storage Services that provides a professional and dedicated team to look after your house or office removals. We offer a range of removal services and storage options for both homeowners and businesses nationwide. Using our removal company and our storage means that you are not against the clock on an hourly rate. We give 48 hours to load your goods. We can drop our units with you if you prefer to load yourself and you load in your own time at no extra cost. Contact us when complete and we will come and collect. Alternatively, we can load for you. We also provide a packing service and packaging to complete the removal. We can arrive on site in the days leading up to your move to help pack your belongings and give advice on your move. 1. We deliver our trailer to your premises – load in your own time. 2. When you are ready we collect and store your goods in that same trailer until you get the keys for your new home or business. 3. NOTE: We do not touch your goods. You lock the trailer and it will not be opened until we return to you. 4. We cannot access your belongings at any time! You have the key. 5. When you contact us, a trailer is returned to your door within 24 hours and you have 48 hours 48 hours to unload instead of goods offloaded into one room and having to sort it out to free up space. 6. Your goods are handled twice – convenience & reduced likelihood of damage we also offer an inventory listing at a small charge if you wish. 7. Take the hassle out of your moving and storage needs.